Thunderkick has teamed up with Casumo Casino to releasing the upcoming Carnival Queen slot exclusively early. Carnival Queen sees you join a wild Mardi Gras street party which takes place on a 6 reel, 4,096 ways to win game engine – playable from as little as 10p a spin on all devices including iOS and Android, it’s full of colour and excitement. It comes with an Avalanche feature which means you get another chance to form winning combinations as winning symbols disappear to be replaced by new ones. The avalanches keep on coming as long as you get winning outcomes. Further to this, a Multiplier feature applies with the multiplier increasing by 1 after each avalanche win – there’s no limit to how high the multiplier can go. This gets better in the Bonus Game feature where you can begin up to 24 free spins – the avalanches can come into play as well as the multipliers. However, if you don’t get a win, the multiplier value won’t reset to 1x – it will stay where it is and can only get bigger. To help you further, a free spin without a win involving a wild will see the wild explode horizontally and vertically to allow new symbols to land – this will hopefully give you a win and subsequent avalanches and increasing multipliers. Nicely designed, Carnival Queen is not for the faint hearted – there’s a whopping 22,700 times your stake to be won from each spin/free spin! 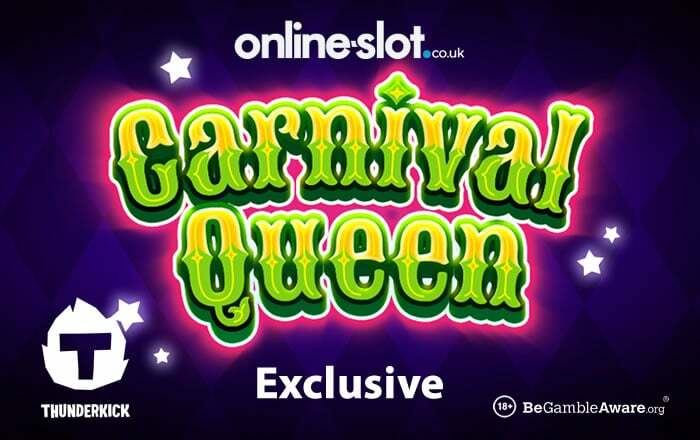 For more info, check out the Carnival Queen slot review where you’ll be able to try for free. Carnival Queen can be played at Casumo Casino until it’s released everywhere else on the 20th of February (2019). The popular casino has slots from Thunderkick, Novomatic, IGT, WMS, NetEnt, Play ‘N Go, Yggdrasil Gaming, iSoftBet, NextGen Gaming and so many others. You name it – they have it. Sign up to get 20 no deposit free spins on NetEnt’s Starburst as well as a generous 100% first deposit bonus up to £300. They have plenty of exclusive titles such as Journey of the Gods and Grizzly Gold from Blueprint Gaming.